Mars pays a visit to the brightest star in the constellation Leo: Regulus. If you don’t often look at the early morning sky, you may not notice that the planet Mars has been drawing closer to Earth. 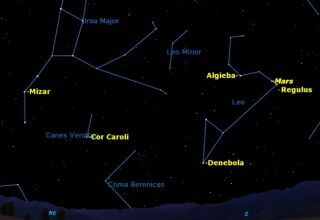 By a happy coincidence, the Red Planet will be very close to the brightest star in the constellation Leo tonight (Nov. 9) and early tomorrow. Astronomers call these close approaches "conjunctions." Tonight Mars will pass just 1.4 degrees north of the bright star Regulus, appearing less than three moon widths away from the star. This will be a very pretty sight, and well worth staying up until 3 a.m. local time to see. But, if you miss it tonight, Mars will still be close to Regulus for the next week. The sky map of Mars and Regulus here shows where they will appear together in the sky overnight tonight. This week, Mars reaches first magnitude, making it one of the brightest objects in the sky. It will continue to get brighter until it reaches a bright magnitude of –1.2 (negative numbers denote extra bright objects) on March 3, its date of opposition to the sun, when it will be placed exactly opposite the sun in Earth's sky. To get the best view of tonight's conjunction, take a look eastward at around 3 a.m. local time. The Big Dipper, known to astronomers as Ursa Major (the Great Bear), will be to your left, and the slanting sides of the Big Dipper’s bowl will point right at the Mars and Regulus pairing. Mars will be slightly brighter than Regulus and obviously reddish in color in contrast to the star. Through a telescope, the disk of Mars is still very small, only 6 arc seconds in diameter, but you should be able to make out its tiny north polar cap. Regulus is the brightest star in the two-part constellation of Leo, the Lion. The right hand part of Leo looks like a sickle or reverse question mark, with Regulus at the end of the sickle’s handle. The left-hand part of Leo is a nice right-angled triangle, with Denebola, the lion’s tail, on the far left. If Mars is too tiny this week to show much, take a look at some interesting double stars. The most famous double star in the sky is located in the middle of the handle of the Big Dipper: Mizar. Mizar was used as a test of eyesight in ancient times. Anyone who could see its tiny companion Alcor was considered to have excellent vision. Can you see Alcor? With a telescope, Mizar itself can be split into a double star, so the Mizar-Alcor system is in fact a triple star. But wait: studies with a spectroscope show that all three of these stars are a double star too close for a telescope to split. All three are spectroscopic doubles, so the whole system actually consists of six stars. Tucked under the handle of the Dipper (or the tail of the Bear) is a tiny constellation with a long name: Canes Venatici. This is Latin for "the hunting dogs," and these dogs are thought to be chasing the Great Bear. Although Canes Venatici has only a couple of stars visible to the naked eye, it contains hundreds of distant galaxies, one of the richest areas for deep sky observers. Closer at hand is the beautiful double star, Cor Caroli. This is Latin for "Charles' Heart," named for the British king Charles, though no one is sure which of the two King Charles the name refers to. Another fine double star is Algieba, just north of Mars and Regulus, one of the finest sights in a small telescope. All in all, quite a few things to look at in the early hours of the morning this week. If you snap a stunning view of Mars and Regulus, or any other sky target, and would like to share it with SPACE.com, send images and comments on the view to managing editor Tariq Malik at: tmalik@space.com.